It's simple, it's fast, it's tasty. What more can you ask for? If you want to make a simple pasta dish but with a different twist than the usual, go for spinach pasta! I love spinach pasta. Not only does it give a pasta dish a lovely depth but the colour is also so appetizing. This is a 10 minute dish! Yup, you heard me right, 10 MINUTES! TIP (Sautéing mushrooms): Using a large pan for the mushrooms is important because the mushrooms must be place in a single layer, otherwise they will release juices and steam instead of getting nice and brown. I know what I'm making next time I have pesto sauce handy. 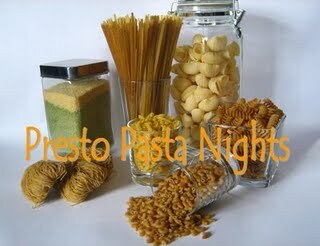 Thanks for sending this in to Presto Pasta Nights! I love 10 minute dishes. And this one has my favorite ingredients that are always on hand - pasta... pesto... and mushrooms. This is just the kind of pasta dish I love. I love mushrooms and pesto. Haven't tried spinach fettuccine before but it looks intriguing. Can you taste the spinach or is it quite subtle? Oh my goodness look at this beautiful pasta!! I love everything about it!